Sunday Night: Partly cloudy. Lows in the 60s and 70s. Monday: Partly cloudy, spot shower. Highs in the 80s. More sun is ahead on Monday, but there may be a spot shower as a cold front crosses the area. 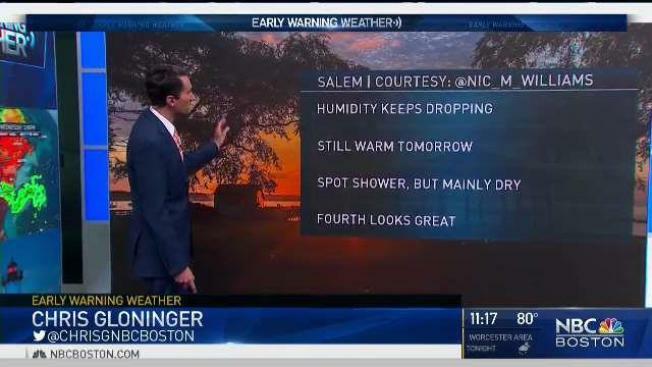 That won’t be a major issue, and behind the front, we’ll find even lower humidity. The Fourth of July also looks sunny and pleasant with low humidity and highs near 80. A mountain sprinkle is possible, but the vast majority of us will stay dry until storm chances increase again Thursday and Friday.